Review: "Voices Of Extreme: Break The Silence" - Sea of Tranquility - The Web Destination for Progressive Music! After hearing this CD I am very pleased that vocalist Don Chaffin, guitarist Rob Katrikh, bass player Bob Brennan, keyboardist Mike Khalilov and drummer John Macaluso make up the line-up of the group Voices of Extreme. Their debut Hypocrite, which I haven't heard, was released in 2005, and Break The Silence is this talented bands latest CD, and I tell you what this is an extremely impressive recording. Don Chaffin's striking and diverse vocals are a great asset for this band, along with excellent guitar work plus of course John Macaluso's colorful drum patterns , makes for enticing listening. Voices Of Extreme have released an album which should have a very broad appeal, "Damned" and especially "Tell Me What It Takes" could easily be hit singles of the melodic hard rock variety. These moving songs bring back memories of how good this kind of music was, as the better ones are few and far between these days. But it's not all hard rock, as Voices Of Extreme get heavier and I was reminded at times of bands like Disturbed. Actually "Blown Away" reminds one of Disturbed with a touch of Soundgarden, and "Apocalypse" sounds similar to Ozzy except Don can sing. Consistency is one of the key ingredients that makes Break The Silence so good. Voices Of Extreme have done a wonderful job with their second album, as it's an intriguing mixture of rocking/ballsy new and classic older styles. If you put this CD on and the beat doesn't make you move then a hearing test may be in order. I'll be honest and say that I'd never heard of V.O.A. until Break the Silence popped into my inbox and if you haven't either, he's the scoop according to their people." Their debut CD "Hypocrite" immediately found favor with critics and listeners alike, propelling them to the forefront of metal's hierarchy. Experts at their craft, V.O.X. has earned song writing credits on Van Halen's DVD "The Early Years," as well as endorsements with ESP, Charvel and Hartke. Their line-up includes Don Chaffin on lead vocals, guitarist Nick Gertsson, drummer John Macaluso, and bassist Bob Brennan. 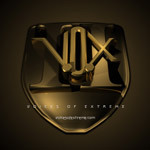 With the task of completing their second full length CD at hand, V.O.X. has added guitarist David Mercado to their line-up. Over the past three years, V.O.X. has shared the stage with Paul Di'Anno, Kamelot, Godsmack, Symphony X, Alice in Chains, Dokken, Zebra, and Twisted Sister, proving themselves as a premier live act on the Eastern Seaboard. The band's continued success and ascension into the ranks of metal royalty have garnered the attention of managers David R. Swales and Nicko McBrain (Iron Maiden). The culmination of the band's talent with this management team will mark the precursor to the next chapter of metal." The next chapter of metal? That's some boast n'est pas? Let's investigate that claim. One thing that is noticeable, possibly because of Nicko McBrain's input is the relative complexity of John Macluso and all the songs are made more interesting thanks to his input. Apocalypse is an fine, aggressive song which could easily gain a place on radio (ok, probably not but that's the world we live in) or on one of the more extreme music channels � it's one of those songs that creep up on you and you find yourself mentally singing in the queue at Tesco. The title track is a fine piece of modern metal as to be fair is everything on the record. Only time will tell if Break the Silence is the next chapter of metal but for now its affine piece of work.